RM Auctions in association with Sotheby’s sold 85 cars in London’s Battersea Park on 1st November in a seven hour auction, including a 1937 Mercedes-Benz 540K Spezial Roadster from the Bernie Ecclestone collection, which achieved a staggering £3,967,125, making it the star lot of the sale and one of the most expensive Mercedes-Benz road-going cars ever sold at auction. RM Auctions started its first London sale with a “Roaring Twenties” preview party attended by more than 1,000 VIP guests, a large number of whom turned out in top-hats and tails, whilst the ladies sported beads, flapper dresses and feathers befitting of the elegant, glamorous and stylish theme. The star of the auction was undoubtedly the 1937 Mercedes-Benz 540K Spezial Roadster from the Bernie Ecclestone collection, which was raised 15 feet in the air to dramatic music, and finally coming to rest above the auctioneer. Following a fierce round of bidding in a room stunned into absolute silence, the bidding stopped at £3,967,125. 800 bidders from all over the world filled the Battersea Evolution centre for RM’s first London auction. 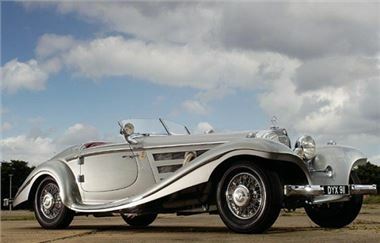 Next to the 540K Spezial Roadster, the Mercedes-Benz SSK comfortably broke the magic million achieving £1.2 million. Three more ultra-rare Mercedes-Benz models completed the round-up of fabulous Stuttgart cars. Although any Mercedes-Benz SSKL is considered a replica as none of the original five examples have survived, the SSKL on offer at Battersea Park had been created using only original S Type parts. This very special car, commissioned in the late 1950s by then General Motors Design chief Bill Mitchell, attracted a final bid of £1,061,625. From the Abba Kogan collection, the 1931 REO Racing Car, raced extensively in Argentina in the 1930s by local hero Ernesto Blanco, fueled a frenzy of telephone bidding from Argentina which only ended when the original estimate was doubled to £470,000. George Harrison’s star attraction, the silver 1964 Aston Martin DB5 sold for an excellent £223,500. The 1966 Ford GT40, achieved a high bid of £983,000 while the fabulous BMW 507 Roadster, one of less than 260 ever produced, brought an impressive £430,238. But not all cars on offer required a large bank account. The first entry of the day, a 1964 Ford Anglia Deluxe Saloon, was bought for £5,588. Acquired in the 1990s by Formula 1 impresario Bernie Ecclestone, this car may well be – next to Harry Potter’s similar transport in ”The Chamber of Secrets” – the second most famous Ford Anglia in existence, and with provenance from its famous recent owner, might even become more valuable over time. RM Auctions is now already looking ahead to its next European auction, returning to the home of Ferrari in Maranello, Italy on May 18, 2008. Guests and bidders in London were allowed a glimpse of what RM is offering next year. The star of the forthcoming May sale is a rare and ultra-desirable Ferrari 250GT California Spyder, one of the most valuable of all road-going Ferraris. One of less than 100 California Spyders produced between 1957 and 1962 in a variety of specifications, this LWB covered headlamp version is estimated at 3,000,000 – 4,000,000. High quality images of the cars in this sale and of the sale evening itself as well as video footage can be downloaded from RM’s new press website www.press-rmauctions.com. Please use username: press and password: London2007 (no spaces). Sotheby's is the parent company of Sotheby's worldwide auction, private sales and art-related financing activities. The Company operates in 34 countries, with principal salerooms located in New York and London. The Company also regularly conducts auctions in 13 other salerooms around the world, including Australia, Hong Kong, France, Italy, the Netherlands and Switzerland. Sotheby's Holdings, Inc. is listed on the New York Stock Exchange under the symbol BID.